1. Irwin T. David, "Privatization in America," in The Municipal Yearbook 1988 (Washington, D.C.: The International City Management Association, 1988), pp. 43-55; David Seader, "Privatization and America's Cities," Public Management, 68 (December 1986), p. 7. 3. E. S. Savas, Privatization-The Key to Better Government (Catham, NJ: Catham House Publishers, 1987), p. 259. 4. 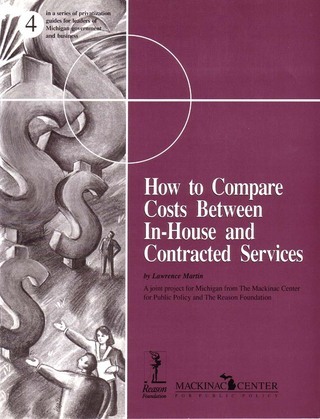 Lawrence L. Martin, "A Proposed Methodology for Comparing the Costs of Government versus Contract Service Delivery," in The Municipal Yearbook 1992 (Washington, D.C.:, International City/ County Management Association, 1992), pp. 12-15; Joseph T. Kelley, Costing Government Services: A Guide for Decision Making (Washington, D.C.: Government Finance Officers Association, 1984), p. 103; Synopsis of GAO Reports Involving Contracting Out Under OMB Circular A-76, (Washington, D.C.: U. S. General Accounting Office, 1980), p. 5. 5. Jonathan Richmond, "The Costs of Contracted Service: An Assessment of Assessments," MIT Center for Transportation Studies, July 20, 1992. 6. Findings of a National Survey of Local Government Set-vice Contracting Practices (Atlanta, GA: Mercer/Slavin, Inc., 1987), p. 2, pp. 13-14. 7. Fully Allocated Cost Analysis: Guidelines for Public Transit Providers (Washington, D.C.: Price Waterhouse, 1987), p. 1. GA: University of Georgia, Carl Vincent Institute, 1991), p. 88. 10. In the step-down method, the costs of support-service departments (e.g., finance, procurement, facilities management, etc.) are allocated to user departments (i.e. line units that directly service citizens) based upon the actual amount of support services received during some prior time period or the anticipated amount of support service to be received in some future time period. For a more detailed explanation of the step-down method see: Guide To Implement the Competitive Cost Review Program (Austin: Office of the State Auditor, State of Texas, 1989), pp. 28-3 1. 11. Peter M. Kettner and Lawrence L. Martin. Purchase of Service Contracting (Beverly Hills: Sage Publications, 1987). 12. John A. Rehfuss, "Contracting Out and Accountability in State and Local Government: The Importance of Contract Monitoring." State & Local Government Review 22 (1990), pp. 44-48. 13. This is the position take by the U.S. General Accounting Office and the U.S. Office of Management & Budget. See U.S. General Accounting Office, 1985 and U.S. Office of Management & Budget (OMB), Supplement to OMB Circular No. A-76 (Washington, D.C.: U.S. Government Printing Office, 1985). 14. Barbara J. Stevens, Delivering Municipal Services Efficiently: A Comparison of Municipal and Private Service Delivery (Washington, D.C.: U.S. Department of Housing & Urban Development, 1984), p. 6. 15. Privatization Study Handbook, City of Cincinnati, Office of Research, Evaluation, and Budget, 1985, p. 17. The City of Cincinnati may use the relative low figure of 4 percent of contractor costs because at one time this approach was recommended by the federal Office of Management & Budget (OMB). However, OMB changed this policy in 1985 and now recommends the use of a staffing formula (see Table 1). 16. E. S. Savas, Privatization: The Key to Better Government (Catham, NJ: Catham House, 1987), p. 260. 17. John A. Rehfuss, Contracting Out in Government (San Francisco: Jossey-Bass, 1989), p. 96. 19. The author has argued this position elsewhere. See Martin, 1992. 20. U. S. Office of Management & Budget, 1985, pp. IV-37. 21. Harry Hatry, Kenneth P. Voytek, and Allen E. Holmes, Building Innovation Into Program Reviews (Washington, D.C.: The Urban Institute, 1989), p. 76. 22. Office of the State Auditor, State of Texas, 1989, p. 32. 23. These cost categories were developed by the City of Cincinnati. See City of Cincinnati, 1985, p. 17. 25. Office of the State Auditor, State of Texas, 1989, p. 35. 26. Donald W. Dobler, David N. Burt and Lamar Lee, Purchasing And Materials Management (New York: McGraw-Hill, 1990), p. 156. 27. For example: John Tepper Martin, ed. Contracting Municipal Services: A Guide for Purchase from the Private Sector (New York: John Wiley & Sons, 1984); Kelley, 1984; Rehfuss, 1989; and Dobler, Burt and Lee, 1991. 28. For example: Privatization Assessment Workbook, Colorado State Auditor's Office, 1989; City of Cincinnati, 1985; Office of the State Auditor, State of Texas, 1989. 29. Ray H. Garrison, Managerial Accounting, 6 ed. (Homewood, III: Richard D. Irwin. 1991). 30. Jonathan Richmond, "The Costs of Contracted Service: An Assessment of Assessments," MIT Center for Transportation Studies, July 20, 1992. 31. City of Cincinnati, 1985, p. 6. 32. Dobler, Burt, and Lee, 1990, p. 156. 33. See U.S. General Accounting Office, 1985 and U.S. Office of Management & Budget (OMB), Supplement to OMB Circular No. A-76 (Washington, D.C.: U.S. Government Printing Office, 1985). Guide To Implement the Competitive Cost Review Program (Austin: Office of the State Auditor, State of Texas, 1989), pp. 28-31. Privatization Study Handbook, City of Cincinnati, Office of Research, Evaluation, and Budget, 1985, p. 17. 34. David Osborn and Ted Gaebler, Reinventing Government (Reading, MA: Addison-Wesley Publishing Co., 1992), pp. 76-78.